In troubled economic times, the risk of fraud and financial crime increases. In our post credit crunch environment, new laws and tougher penalties for financial crime mean that if you are in business, you have a responsibility to help fight fraud. However, to design effective, proportionate fraud controls for your business, you need a complete picture of all the risks. 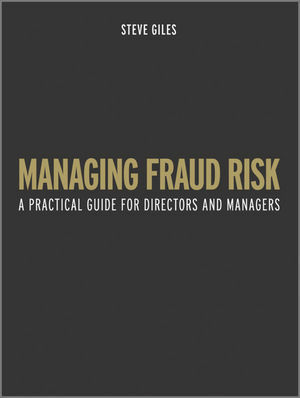 Managing Fraud Risk shows you where to look for fraud, setting out a route-map for finding and fighting fraud risks in your business, with the practical, strategic advice you need. Combining the latest theory with forensic risk analysis, this book reveals how you can provide assurance to your Board and stakeholders. Practical examples are used to clearly show cost-effective techniques for preventing and detecting business fraud. An innovative fraud awareness quiz enables you to easily apply the theories and principles. Answers questions such as: Who commits more fraud: men or women? How many of your employees are prepared to falsify documents? This route-map is essential reading to help you navigate the complex landscape of business fraud. Steve Giles is a chartered accountant with over 20 years experience of fighting fraud. This began with his involvement in the Polly Peck investigation in the early 1990s and continued with a variety of forensic accounting assignments whilst still at Deloitte. Now a consultant, Steve has worked on many fraud investigation cases in the UK, Continental Europe and the US, whilst also advising his clients on the most effective measures that they can take to prevent, deter and detect fraud in their organisations. Today he lectures extensively around the world on fraud and financial crime matters generally and also on the broader subjects of corporate governance, risk management, auditing and business ethics. He is an Associate Member of the Institute of Chartered Accountants in England and Wales.